(CNN) -- The top U.S. commander in Afghanistan said Thursday the coalition in the war-torn country is going to have to do things "dramatically differently, even uncomfortably differently" in order to succeed. Gen. David Petraeus, the U.S. commander in the Middle East and Central Asia, said Thursday that victory in Afghanistan "is going to be ultimately similar to what we have achieved in Iraq. "A situation which we can hand off to Afghans -- responsibilities for security and for governance, keeping in mind very much that Afghanistan is not Iraq," he said during an interview with NBC's Brian Williams at "First Draft of History," a two-day program in Washington pairing journalists with public figures. President Obama met Wednesday with his national security team to discuss the strategy for Afghanistan, which he has called a "war of necessity." Petraeus said two more three-hour meetings are on the schedule next week. "I think it always appropriate to go back to what's the mission, and what it is that we want to accomplish, and that is what is being discussed now," Petraeus said, noting that those involved in the talks are not yet at the point of discussing resources and numbers. "There is a reason why we went to Afghanistan. It was 9/11. And the reason we went there and the reason we're still there certainly is to ensure that Afghanistan does not once again become a sanctuary for al Qaeda and other transnational extremists," he added. Some advocate a full counterinsurgency, which would involve a large number of troops focused on fighting the Taliban, plus efforts to rebuild the country and its economic system. Others favor a counterterrorism strategy in which a limited number of troops would target only al Qaeda. Afghanistan, McChrystal said, is a "complex, difficult terrain -- both the land and the people." "When I'm asked the question what approach should we take in Afghanistan, I say humility," he said. The average life expectancy there is 44 years, McChrystal noted. And given that the country has been at war for 30 years, there are few people who remember pre-conflict life in Afghanistan, he said. Most recently, Afghans have been struggling with a "crisis of confidence," McChrystal said. "Afghans are frustrated after eight years of the most recent war because in 2001 their expectations skyrocketed. Along with the arrival of coalition forces, they expected a positive change," he said. Some of those expectations were unrealistic, McChrystal acknowledged, but regardless, there's been a "mismatch between what they hoped for and what they have experienced." 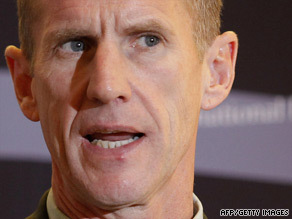 McChrystal said the situation is still winnable, but "waiting does not prolong a favorable outcome. This effort will not remain winnable indefinitely. "Public support will not last indefinitely, but the cruel irony is that to succeed, we need patience, discipline, resolve and time," he said. The question of who is winning now depends on whom one asks, he said. "This is not a game with a score ... It's more like a political debate, where both sides announce after the debate that they won," he said. "Winning the battle of perception is key." Going ahead, the United States needs to set priorities, McChrystal said, because its resources are inadequate to address all of the problems. The forces on the ground need to reverse the perceived momentum of the insurgency, help rapidly grow the Afghan national security forces and "improve their effectiveness and our own through closer partnering." "The objective is the will of the Afghan people. We must protect the Afghan people from all threats. From the enemy and from our own actions," he said. Asked what the consequences will be if he requests more troops and is denied, McChrystal said any decision to go forward will be based not just on resources, but on the goals of the mission, which are being redefined and clarified. "I don't think that if we align our goals and our resources that we will have a significant problem," he said. "What our problem would be is if we didn't."